Calculating tonnage for the entire deposit, assuming 6% and 20% grades, as reported by exploration programs, yields 682 million metric tons to 2.27 billion metric tons, respectively. The deposit underlies 600 square miles east of Holbrook, Arizona. The top of the potash is situated from 700 to 2000 ft below the ground surface; most of the deposit is found at about 1200 to 1300 ft deep. Maximum thickness of the potash is about 40 feet. Total volume estimates range from 5.68 to 6.45 cubic kilometers. 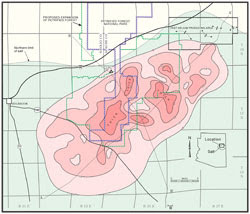 The report, “Potash and related resources of the Holbrook Basin, Arizona” (AZGS Open File Report 08-07) is by AZGS geologist Steve Rauzi, and is based on analysis of drill hole logs and cores. A summary of the report is in the AZGS quarterly newsletter published today that is being mailed out to 4,000+ readers, and available to read or download at our Web site. The Arizona deposit is not currently included in the U.S. resource inventory of 6 billion tons, so could increase the national resource base by more than a third. Our release of these resource estimates comes amidst reports of potash shortages. Last week there was only 75,000 tonnes of inventory in North America at a time when there should have been 1 million tonnes, and warehouses in Port of Vancouver were described as effectively empty. The Potash Corp. of Sasketchewan (PCS) says potash prices have more than tripled to more than $1,000 a tonne this year and inventories are at record lows. The PCS CFO said yesterday that potash producers are unable to supply 8 to 10% of world demand this year. He predicts a potash shortage for the next five years. A year ago, potash spot prices were about $200 per tonne and three years ago were in the $50-100 range.